Last night I had some pretty wild dreams. 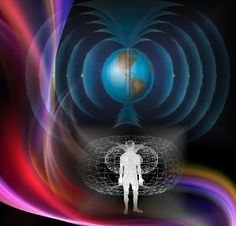 If you are starting to become super sensitive to your electromagnetic field, like me, you will have guessed that CIRs correlate with unsettled sleep … also, the effects of CIRs show up about a day beforehand, as the CIR is approaching Earth. The spaceweather.com report for Saturday, 2 April 2016 says NOAA (the National Oceanic and Atmospheric Administration) anticipates a G2-class geostorm today because of an incoming Co-Rotating Interaction Region (a CIR). There is a 60% chance of this. CIRs occur where fast-moving solar wind streams touch slower-moving solar wind streams. The CIR, which is the interaction zone between the two velocities, quite naturally has some sheering action and shock waves, resultant from unpredictable, swiftly changing density gradients. This sparks auroras on Earth. It appears the human EMF is similarly affected; I find wild dreams to be one of the outcomes … as if there were auroras taking place round my dreamtime thoughts. Image: Earth, showing its toroidal EMF, and Man, showing his toroidal EMF … https://s-media-cache-ak0.pinimg.com/236x/9f/ae/f3/9faef36525b4b9bdad541fb438ac79c9.jpg ..
Link: “Electromagnetic Hypersensitivity,” in Wikipedia … https://en.wikipedia.org/wiki/Electromagnetic_hypersensitivity ..
Video: “Spirit Science 21 ~ Toroidal Flow,” by Spirit Science, 6 November 2012 … https://www.youtube.com/watch?v=1-4zdmd0TNU .. This entry was posted in Astral planes – dreamtime realm (see also ’03 – Astral body’), Astrogeophysics - EMF - hologram, Human torus and tagged Ascension, astrogeophysics, auroras, awakening, CIR, co-rotating interaction region, dreams, earth EMF, geostorm, human EMF, Human torus, toroidal flow on 2 April 2016 by Alice B. Clagett.